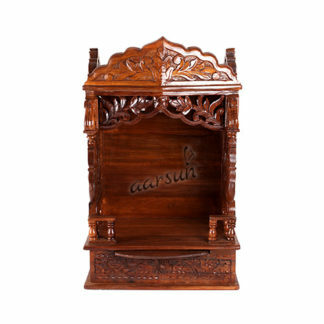 Aarsun Woods brings to you this handmade Wooden Pooja Cabinet suitable for homes and offices. The Temple is made from Premium Quality Teak Wood with traditional carving and finishing. The temple is in Teak Wood except for the base where idols are to be placed and the ceiling where dome is placed which is in premium quality plywood. At the top of the temple beautiful “Ganesh” design with floral engraving done over there. Below that there is main place for deity in closed set which give some personal space to your deity.Afterward there are two drawers for puja essentials like incense stick, matchsticks,rosewater etc. As we are the manufacturers so customization are available as per the need of the customer.The temple is made from teak except for the plywood used at the back, ceiling and the base of the Temple.